"This is a variation of the traditional Apple Crisp that I dreamed up one day when I didn't have enough apples, and there were pears in the fruit bowl, and leftover toasted walnuts from something else. We love it. Cranberries can be substituted with raisins or dried cherries. Comice pears taste best with this recipe." Preheat oven to 375 degrees F (190 degrees C). Lightly grease an 8 inch baking dish. Mix the apples, pears, cranberries, 1 tablespoon flour, honey, and lemon juice in the prepared dish. In a bowl, mix 1/2 cup flour, brown sugar, oats, walnuts, and butter to the consistency of coarse crumbs. Sprinkle loosely over the fruit mixture. Bake 45 minutes in the preheated oven, or until brown and crisp on top. 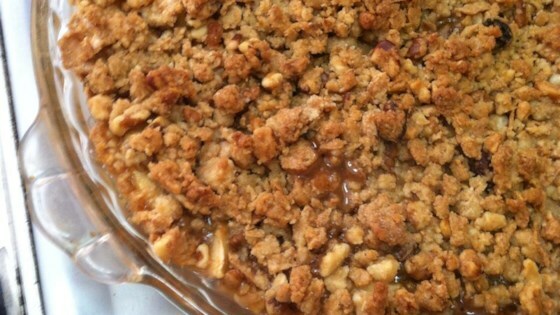 This was a great recipe-I used Golden Delicious apples when I made it. Next time I make it, I will definitely serve it with vanilla ice cream. I tried this recipe for our office Christmas dinner and it was wonderful! Very easy, flavorful, fruity and not too sweet. I added a 1/2 tsp of cinnamon and 1/2 tsp of nutmeg. Thank you!